The Royal Wedding was impeccable!! Absolutely stunning. I loved seeing all the hats & pomp & regalia. So romantic!! But even as I enjoyed watching & making up a silly Brit guest name for myself & all that, I couldn’t help but feel sorry for Kate. I’ll tell you why & get a bit personal, even if perhaps it is a little uncomfortable, because I think it important to share especially for all those young girls yet to marry. It’s time we’re open about some of these things since the world so openly flaunts their side. I don’t want my daughter or nieces to grow up hearing/seeing that weddings are for “bridezillas” & a big show, all about the flowers & invitations, etc. which is what the world tells our little girls. I want them to hear Truth so they can make good decisions when it’s their turn. I hope the following words ring in their ears as they wait for their prince. I’m sad for Kate because (hopefully) this will be the only wedding she gets. And although it was perfectly performed, neither of them had that sparkle in their eyes that comes from two people who saved themselves for each other. Sorry, I just have to say it. She was gorgeous! He was dapper (with his hat on). His smile would melt any woman’s heart. Since I really only follow royalty for weddings & babies, I hadn’t honestly even heard of Kate until this last week. But after hearing their story, I just couldn’t help but feel sad for her. They have been living together for how long?? She sold herself cheap to him years ago. And he didn’t respect her enough to give her anything but a hussy reputation & non-commitment for ten years. He didn’t even look her way until he saw her on a cat walk in lingerie! Now THERE’S real love, my friends. Goodness. I just shake my head. How embarrassing for both of them. I know it’s “old-fashioned”. I know it’s passed off as to be expected, shacking up before marriage. I know some even think a “trial run” is a good thing, even after we’ve known for years that research proves premarital relations cause problems in marriage period, even if you don’t believe God tells us the best way to live this life in His Word. I know it’s perceived as “judgmental” to say anything. I also know without a doubt that what I’m saying is true & I just don’t hear people telling their stories to prove it much. I’m not sure if the quietness is due to embarrassment at themselves not doing it right, or for whatever dumb reason, being embarrassed at having come to the altar unscarred?? All I do know is I’m sick of seeing so-o-o-o many trodding down the same crooked, beaten down road; many not even having a clue there is anything wrong with what they are doing – that’s the truly sad part. I say something out of concern because, as two who did get there unscarred, I can tell you without a doubt IT IS WORTH IT!! Only by God’s grace were we raised in homes that taught us the Truth & we listened. We didn’t see how far we could go without getting caught. We didn’t date around & give bits of our hearts to people before we met. Even after we were engaged, we didn’t do anything alone that we would be ashamed to have our parents or Jesus sit next to us & see. As a reward, Keith & I don’t have to wonder if the other still has feelings for some long-lost lover or live in guilt or shame, remorse, insecurities or comparing. We don’t spend any time untying tight knots of issues in our hearts from giving ourselves too early or to others. He respected me enough to wait for me. THAT, girls, is a PRINCE! I loved him enough to save him my whole heart. And the blessings that flow from a marriage free from all that garbage is beyond what all the money in the world could buy. So many never have that – I want that for my children! Keith & I pray for that now for each of our children and the little ones in our extended families & church. It starts by teaching them early that it’s worth it to wait for that special one God has for them. This whole crazy dating early stuff has baffled me for years! Why encourage that with children too young to handle it or be ready for it? Shouldn’t we as parents be protecting our kids from this? I just don’t understand that, but sorry, I digress. Kate will never see in Will that look I saw in Keith’s eyes on our wedding day. It’s not anything I can put into words, it’s just worth waiting for!! I tear up every time I remember. I could feel God there. He made two people one that day. It truly is a mysterious thing, but it’s true. When we watched the video the next year, apparently a baby was fussing pretty loudly the whole time we said our vows to each other, but I never heard a bit of it. I was totally enraptured. All I remember was the tender love in Keith’s eyes & the complete heart I was able to give him as we promised ourselves to each other to the end of our days. I remember my heart fluttering & the flush in my face as Keith put his hand on my waist for pictures – that was the first time he’d ever done that. 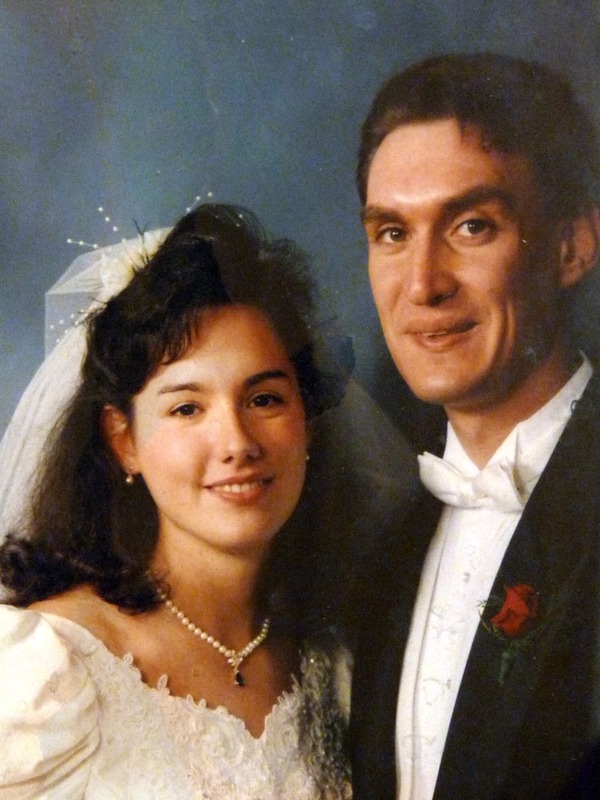 We had saved “quickening” our love inappropriately until our wedding day & it made that day inexpressibly precious! I saw none of that mystery for obvious reasons with Will & Kate. As beautiful, memorable, regal, ceremonial, etc. as it was Friday, for Will & Kate, it was just the beginning of a lifetime of that kind of thing. But that special day when you give yourself to another can never be recreated. God intended for that to happen on your wedding day to cement you two together for good. He knows best – He made us. I can tell you, it is worth the wait! And even if you spend tons of money & have the world a twitter at your smashing dress, if you don’t do it the way God intended, you end up with a whole lot of needless heartache guaranteed. I say all that with no malice, only to tell those little girls (& boys) watching that they can have better! 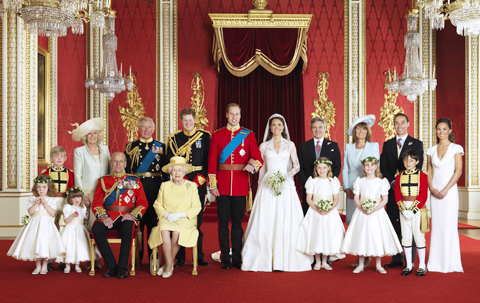 Kate & Will have NOTHIN’ on my wedding & it had nothing to do with the dress or fanfare, etc. I want for my children to have the awesome day God intended for them to look back on with wonder & romance & joy all the rest of their lives. It is not naivety, it is love & wanting only the best for our children. And as long as God gives me breath, I will teach them & guide them to that end until they say “I do”. I pray Will & Kate have many, many happy years together. It will be fun to watch them have a family, her wear beautiful clothes, etc. I love that kind of stuff! But I also know, with the start they had, there will be major storms coming. Every marriage has storms, but they will have deep scars & issues due to the last ten years that will require either Jesus to heal (and He can!) or a whole lot of faking it to the media. It just makes me sad. I pray when those storms come, they look to Jesus to take their broken pieces & make something truly beautiful as only He can. I really do pray that for them. Next planned post (a follow-up): Now What? We were just talking the other day in small group about sarcasm & how dangererous it is period. I’m the one who brought it up! Keith & I determined very early on in our marriage that even though it’s funny sometimes, it causes LOTS of damage to relationships & that’s just one place we won’t go. Well, apparently, even though we’ve tried, it has crept in. Sorry to be so quiet lately. It’s been pretty busy around here, but among the many goings on has been both a Thirst Conference & an Anger Resolution Seminar in the last month. So much to share, but only time to pass on a bit. The Lord keeps bringing the following little nugget up in my life a lot lately so I thought I should type it out. Maybe it’s something you will find useful in your life, too. This is from the Gothard material I’ve been studying lately; both the Anger Resolution conference & the Commands of Christ curriculum (Command #3 – Rejoice). – Commands of Christ – a 49 week discipleship challenge. If you click the window on the right that says “select a command”, a drop down window will allow you to click through all 49 & select whichever one you want to study. You can have daily emails sent with links to help you dig daily into the wealth of materials here. – Nancy Leigh DeMoss’ Revive Our Hearts radio program – You can listen to past programs here, or set yourself up to have it come into your iTunes or email automatically every day. I have enjoyed these daily broadcasts SO much! If you’ve never heard it, might I suggest you start with this series. I give it three sessions & you’ll be hooked! I Got Issues. You Got Issues. All God’s Children’s Got Issues. Last time, I posted about difficulties in our lives beyond our control & our response to them. But what about when I’ve messed up & it was something really stupid & frankly, sinful on my part? Wow, God couldn’t use that, could He? What’s the right response to sin in my past? Or sinful bents in my life I’m wrestling with right now? Confess & repent of your past sin, & give your weaknesses to God. Don’t wallow in it, either by excusing it as “just the way I am” or letting it get you so discouraged you feel worthless. Understand that He delights in turning that very weakness into a strength so He alone gets the glory for it. Peter – so fearful he denied Jesus three times. Turned around to become the one chosen to preach the first gospel sermon a few weeks later on Pentecost, leading thousands to Christ at one time. Paul – legalistic Jew, murderer of Christians. Turned around to become the one hand picked to show the Jews God’s covenant had been extended to the gentiles. Then being the first to go out & spread Christianity around the known world. 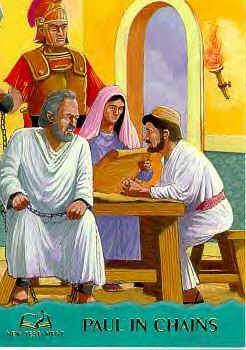 David – committed adultery with Bathsheba, even having her husband murdered! These two turned around to become the very couple God used to bring Solomon into the world, & Solomon was the one who ushered in the golden era of Israel & built the greatest temple to our God this side of Heaven. God could’ve chosen any other of David’s vast array of sons, but He chose one from the union with Bathsheba; one that really never should’ve ever been. Yet God didn’t forever curse that line as we would humanly expect, but instead used it greatly, even leaving us with three books in His Word from the mouth of that very seed. Interesting. These guys were all in pretty bad shape due to poor choices they had made in their past. They all had choices about where they were going to go from there. Each chose to give it to God: their past, their present, & future. They all took their sinful nature to the Potter’s house to shape as He wished & look what God did! God has given each of us our personalities, strengths as well as weaknesses, for a reason. We all have some of both. Don’t make the mistake of thinking He only can use your natural talents or certain spiritual gift for His good uses. More often, I’ve seen Him take weaknesses & shine His glory through them. Into a self-centered person, He wants to infuse thoughtfulness & genuine kindness to others. He wants to tame loose lips & set them free to speak encouragement & Truth instead of gossip & discord. He wants to turn our anger into peace, patience, & gentleness. Our greed into generosity. Our jealousy into contentment. Lust into true love. Laziness into diligence. Worry into faith. Fearful hearts into trusting ones. Pride into gratefulness for all that others have done for you. Gluttony into self-control. Gloomy dispositions into joyful hearts. Rebellious hearts into ones that desire goodness & to be obedient. What’s your issue? We all have at least one. Whatever it is, God wants to take that & turn it into His victory badge, shining out for the world to see HIM. Don’t wallow in your weakness. We serve a powerful God! He can turn it around. In fact, THAT’S HIS PLAN! Trying to change those things any other way won’t work. You can’t turn it around in your own effort. That doesn’t make you bad or uniquely broken (so don’t go blaming yo momma), that makes you human & in need of a Savior. Welcome!! If you’ve been discouraged by your weaknesses, take heart. He can take that very issue & make it His shining moment. He WANTS to do that. But in order for that to happen, you have to daily hand that issue over to Him to handle. And that, my friend, is exactly the point. That’s where He wants us! On our knees & fully dependent on Him daily. Think about it. How else would He get us there? Just like the ten commandments are there to show us our sin & point us to God, those weak spots in each life are there to remind us we aren’t God & we need Him desperately. Keith & I were having our Saturday morning chit-chat this morning. We talk about the kids, house, stories we didn’t have time to share during the week, the future, etc. One thing leads to another usually & we kind of bump along. Anyway, this morning we started talking about a certain situation we have no control over & we were giving each other the pep talk – God’s got it handled & will change it when it’s time. It’s one thing to say God can change the situation. He can! That’s true. I’ve often reminded myself that God changed Pharoah’s heart with the ten plagues. He can use all kinds of things to change this situation we’re in if & when He chooses. But for whatever reason (& we don’t have to know), He chooses not to right now. We just need to trust Him in that. “All things work together for good to those who love Him & are called…” I know that. Somehow, God’ll work all this mess out for His good purposes. Ever thought that way? That’s all true, but we got to thinking beyond that this morning. What if Joseph thought that way? He probably did for a while. But somewhere in all that prison stuff, he must have made the switch to thinking… God IS working IN all this. He’s not just allowing this & choosing not to change it for whatever reason. He is working His will IN it. He wants this to happen. This is GOOD. I’m pretty sure Joseph made that thought switch because he didn’t spend his life wallowing in the prisons. He would’ve had every right to get all sorry for himself & feel like all the talent & privileges God gave him had been squashed due to his brothers’ stupid sinful hearts. If only they… But he didn’t. He got busy being productive in spite of all that pain & unfair treatment. Keith brought up Paul. The very last verses in Acts say this, “For two whole years Paul stayed there in his own rented house and welcomed all who came to see him. Boldly and without hindrance he preached the kingdom of God and taught about the Lord Jesus Christ.” Paul was under house arrest here. A guard was always by his side & he was not permitted to go to the mission field like he had been “called” to do. Some might say his life calling had been thwarted or stunted. Doggone it! He wasn’t free to do what God wanted him to do! Yet it says “without hindrance”. God was orchestrating the whole thing & Paul knew it. Paul was aware that God was working IN his imprisonment, not that He could change that situation if He wanted to but for some reason was choosing not to. See the difference? That’s huge! Whatever is going on in your life right now, yes, God could change it if He wanted. Yes, He is choosing not to for His own good reasons. But try telling yourself this truth, too: He is working His good purpose in that circumstance right now. In the middle of the pain. The frustration. The limitation. Don’t think that the end is good, but the means getting there is just to be endured. He could’ve made a different means to get there but He didn’t. He chose this path for a reason. And don’t think for a moment He is not aware of what is happening. Not only is He fully aware, He brought THAT to you for a reason. Yes, I said THAT. Even that!!! Whatever “it” is. Rest in the fact that He IS WORKING in that. Right now. Know that YOU are not hindered from God’s great plan in any way. I needed to hear that this morning. Maybe you do, too. This whole post is assuming we have no control over our situation & there’s no sin on our part involved. Next post: when we’re in a bad circumstance that was or is in our control – due to bad choices. My seven year old & I had one of those awesome teachable moments today. First of all, this child is all boy. And he hasn’t found his reading genre yet. Let me get those two pieces of information out right now. He’s a very good reader, but my older two had already found several series they loved by the time they were this age. Anders, my seven year old, likes action more than sitting & reading in general. When he does sit & read, he reads what I tell him to & that’s about it. Enter stage right, Dav Pilkey. 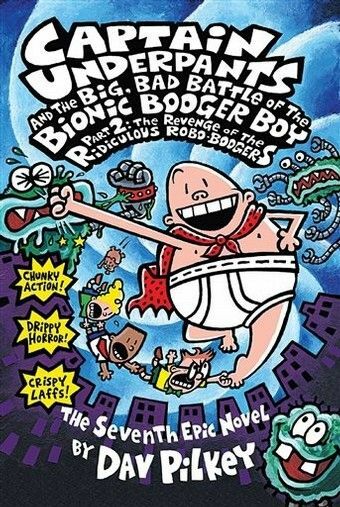 If you haven’t seen a Dav Pilkey book, I’d have to say count yourself lucky. To say he’s geared to the six to eight year old boy is an understatement. Check out his site to see what I mean. Anyway, our oldest boy happenstanced upon the Pilkey shelf one day at our library, much to my chagrin, & Daddy said he could check out a few of his books. Six plus years later, he still likes them. The legalist in me wants to ban them entirely, but I try not to say anything about it – it’s a boy thing between the boys & their dad who by the way is a very godly man so for me, it’s a trust issue God’s teaching ME here. Anders does every once in a while get them out & sits to read/laugh at them. He pulled out a stack of them just this morning. I sat down beside him & read a few chapters & laughed with him. They are funny if you put yourself in a seven year old boy’s world. I have to admit, there is something great about a cute little seven year old boys giggle. Even if it’s at a certain Captain Underpants. Okay, so I thoroughly enjoyed & laughed heartily at the chapter where a robot drinks prune juice & the people he ate are “released”. The drawings got me. And I got carried away with the moment, I’ll admit it; I was intoxicated by Anders’ giggle. Anyway, something possessed me to show Anders the website to let him color some pages, activate a few flip-o-ramas on line, hear a song or two. Nate showed me that site years ago, but Anders has never seen it. We enjoyed a good laugh over the burp song (the real title is s bit more crude). He had Super Diaper Baby dance a few jigs. I assured him that if I ever caught wind of him singing the burp song, etc. at church, in front of Grandma, etc. he would never get another Pilkey book out again NOR see that site again. We talked briefly about discretion & a few more minutes went by. I wanted to make sure he understood the difference between “bad” & funny but only in the right context & place. I mean, I dont’ want our children thinking we’re hiding stuff here. I don’t want them thinking there are two sets of rules or that we are faking it out & about. You have to admit, discretion is a difficult concept for a little guy. We talked about how there’s nothing bad about tooting or burping – God made our bodies to do that. And it IS funny! I’m sure Jesus laughed a time or two about those things as a little boy growing up. We talked about the songs & how the one song that did bother me was the one about Mr. Krupp, the principal. It didn’t talk highly of him; not horribly disrespectful, but enough to make me talk about it. I asked Anders if Jesus would be happy or sad about anything we listened to or read today. We talked about how Jesus IS here with us. Does He think this is funny or if not, what would He be sad about? We talked about the “funny feeling” you get in your heart when something’s just not right. I explained how right now, Dad & Mom are Anders’ protection & when we feel something’s not right for you, you’re not allowed to watch, read, hear it. Once something goes in the brain, it’s pretty much permenant. As he gets older, the goal is for him slowly but surely, a little at a time, take that over until when he’s in college, he needs to be able to hear God & know that “funny feeling” when something’s not right, turn it off, close the book, etc. all on his own without Dad & Mom’s protection. That takes practice. He mentioned Runescape, a game Nate plays on line that makes Anders feel funny. I explained that Runescape is one of those areas we are letting Nate practice on right now. What is wrong for Anders may or may not be wrong for Nate. It’s between God & Nate right now. THAT’s why it’s so important to be in God’s Word every day & talk to Jesus about everything. The Bible doesn’t say “You can listen to the burp song, but the principal song is bad.” We need to know what the Bible says about honoring our authority & to everything there is a season, etc. Jesus gives us the Holy Spirit to let us know when something’s not right using God’s Word. We need to listen & respond every time we feel that tug. THAT’s how the Holy Spirit guides us. Our job is to be “in tune” to Him. It’s very easy to just ban something or tell your child something’s bad. And many things are in the world today. But there are some opportunities for us as parents to loosen the reigns a bit & let them find out what the Holy Spirit’s conviction feels like. Knowing most of Pilkey stuff is just really gross, I let Anders hear a few songs & dance a dance or two. It didn’t take long before the funny wasn’t quite so funny & you could tell he didn’t feel real good about it. We talked about how Seeds songs are different from say, these Pilkey songs, because God’s Word is living & unique & straight from God. Those words never make you feel weird or gross & it’s never wrong to sing them in any circumstance. Lots to chew on. He thought about it & took it all in. So, when it’s all said & done, I thank Pilkey for our discussion today. Thanks for giving us a springboard to talk about discretion, discernment, and conviction. Great lessons there for a seven year old or a forty year old! A side-note conversation I wanted to remember was Anders saying he wanted to share Jesus with others, but everyone he’s ever around already knows Jesus. SO, we also talked about how that is why it’s so important for us to be on our best behavior when we’re out & about running errands, etc. We represent Jesus to those around us who may not know Jesus or us, but they see us pray before we eat, etc. And if we are then nasty to little brother, disobedient to Mom, or just disrespectful in general to others in the store, they see that! Likewise, we witness to them when we show patience with brother, love to Mom by instant obedience, have a joyful heart, are gentle, self-controlled, etc. Those fruit of the Holy Spirit are what we want those around us to see in us & know that Jesus makes a difference in our lives. THAT’s how we share Jesus with those around us. With all the hard boiled eggs around these days, thought it’d be a good time to share a time-saver my MIL passed on to me years ago. In the old days, when making egg salad for sandwiches (we call them Easter egg sandwiches around here to keep those salad haters from snubbing) I used to slice each egg one way, then another…tedious & messy. 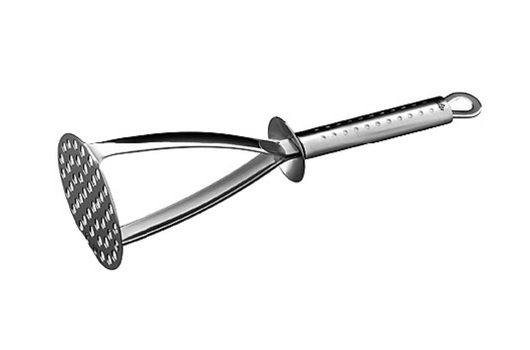 NOW, I simply whip out the potato masher & just smash them. Love it!!! SO-o-o-o much easier & less messy. They get cut up uniformly & it’s quick, too! Once you try it you’ll never go back. The trick is finding a study old-fashioned masher.